A sweater dress is probably one of the most effortless and cozy pieces of clothing you can wear during the colder months. I don't own any sweater dresses previously so I am happy to add the first one to my winter wardrobe. The quality is nothing to write home about but I like how effortless it looks. I adore the front pockets and am also a fan of the color. Still getting used to the longer length but so far, I am loving it. Hope you all had a nice Christmas break. I am still off from work for the rest of the year and am looking forward to spending time with my family before saying goodbye to 2015. Such a cozy and cute look Sydney. I hope that you had a beautiful Christmas and wishing you a Happy New Year! 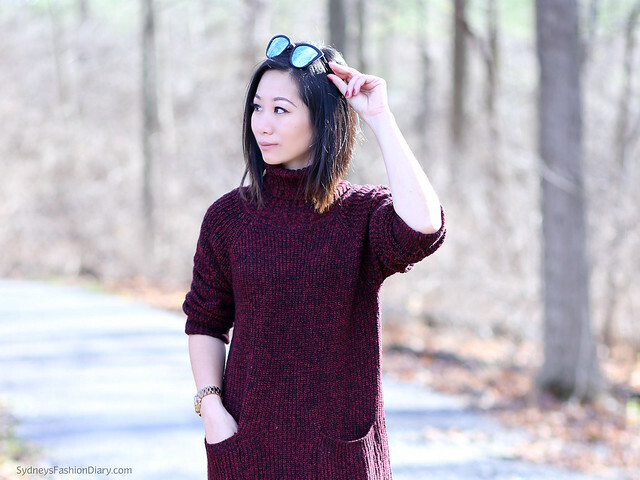 Can't go wrong with a cozy sweater dress in winter - Wishing you all the best in 2016!